This post is a must-read for anyone that is thinking about installing your own sprinkler system. There’s a lot that goes into it, but we saved thousands my DIYing our sprinkler install. So, you planted the grass and worked so hard to make it grow. But, you had to go out of town for a couple weeks and it all died because you couldn’t water it. There’s nothing worse! Summer is coming up and if you’re lucky, you are probably going to be doing a little bit of traveling. We went away last weekend to the Oregon Coast for Memorial Day. I was so thankful that we didn’t have to think twice about watering our newly planted garden or our lawns. I am so glad that we took the time last Fall to install our own sprinkler system so we don’t have to think about watering our grass or plants anymore! 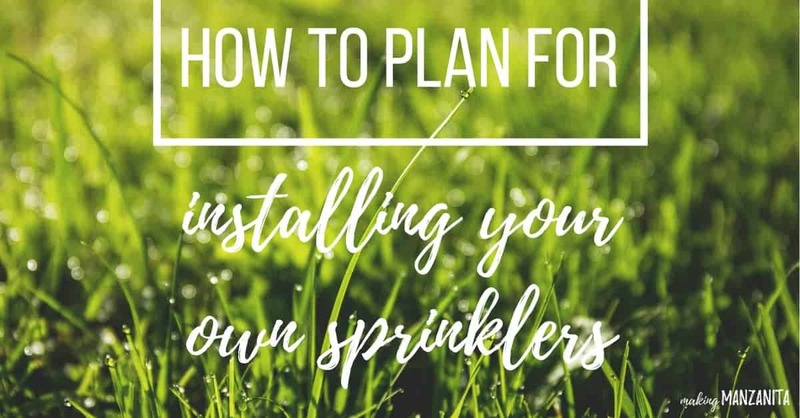 Today I am sharing the love and giving you the inside scoop on everything you need to know about installing your own sprinkler system. When we moved into our house, we inherited a field of weeds. No grass. No sprinklers. Not even a fence to hide the hideous yard! You can check out what we’re planning on doing to our huge backyard here. Our plan for our little fixer upper is to someday be able to turn it into a rental property (finger crossed). So as we are doing home renovations we are always thinking of future tenants. Adding an automated sprinkler system not only adds value to our home, but will be a draw for future renters. Since we knew we needed a sprinkler system, we started to doing some research on getting sprinklers installed by a professional. We quickly realized that it was totally out of our budget (upwards of $3,000-$5,000). If you know anything about my hubby, Logan, you know he is the type of person that says “no way, I can do that myself!” Installing your own sprinkler system turned out to be not as difficult as we imagined. But it did required a lot of research and a lot of sweat equity – something that we’ve gotten real familiar with since buying our little fixer upper! Although installing your own sprinkler system is labor intensive, we ended up saving thousands of $$ by installing the sprinklers ourselves. 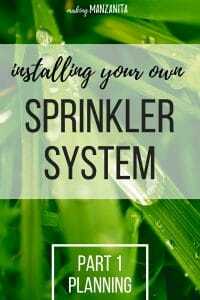 I’ve tried to take the pretty complicated process of installing your own sprinkler system and create a trusty resource guide that sums up everything you need to know about installing your own sprinkler system. For your convenience, I’ve linked to a lot of helpful tools, products and guides to explain everything in granular detail for ya! There are great above-ground sprinkler systems available nowadays! They could totally work for you, some even come with timers. Here’s why we chose to install an in-ground sprinkler system instead. Above-ground sprinklers take over a hose bib. For us, our hose bib was a hot commodity. We only have one hose bib in our backyard! When we were running with an above-ground sprinklers, we used this splitter & timer to create additional bibs. That’s a great work-around. The maximum flow from your hose can’t cover multiple zones. We have a large rectangular lawn. If we were to keep our above-ground sprinkler, we needed to move it around the lawn in 2-3 different spots. That just wasn’t gonna happen. You aren’t a slave to watering your yard! You don’t have to remember to water the lawn and it still looks fabulous. With this guide for installing your own sprinkler system, you can create a customized plan for your in-ground sprinkler. It is literally as easy as setting it and forgetting. Out of sight, out of mind. You can go out of town for a few days and not have to think twice about your lawn or plants getting watered. We purchased everything we needed for our sprinkler system from The Home Depot (our supply list will be in next week’s post about the install portion). You can also purchase almost everything from Amazon if you don’t mind waiting for it to ship for a couple days (and if you’re signed up for Amazon Prime, you get FREE SHIPPING!). I’d also recommend seeing if there is an irrigation store in your area. You may be able to save money by buying local with someone that specializes in sprinklers. And at the very least, you’ll be shopping small – which I always love doing! Before you get started installing your own sprinkler system, take a look at your local codes and water utility. There may be rules or permits required. You can probably find this by doing a little googling or calling your city. You definitely need to have a detailed plan for your backyard, especially if you’re starting pretty much a blank slate like we were. Be sure to plan your landscaping for the long run. We added some extra zones on areas of our yard that aren’t landscaped yet, but I know I will want to add someday. Planning out your long term landscaping is essential and will save you money down the road. It’s much easier to add a zone now, rather than later once everything is said and done. 1. First things first, what’s a zone? Zoning your landscaping allows you to create different areas of water coverage. Trees, plants, bushes, gardens and lawns all need different levels of watering. By creating zones in your sprinkler systems, you are able to target the water distribution and program your sprinklers accordingly. Drip irrigation is typically for trees, flowerbeds, gardens, potted containers or other non-grassy areas. Drippers are designed with a series of tubes that have holes in different locations designed for specific plants. They apply water directly to the plants in a low volume. This type of irrigation reduces water waste by delivering water directly to the plant base, from evaporation, runoff, and prevents unwanted weeds from growing. Sprinklers are typically used for lawns. You can also use sprinklers for landscaped flower beds, but they will need to be in a separate zone than the lawn because they require different watering patterns. Most yards require a combination of sprinklers and drip irrigation to water everything efficiently. 3. Should trees be on drip or sprinklers? Trees should always be separate from planter beds, garden area and other plant life. Since trees need long soaks, they are suited for drip irrigation. For instance, you may want drip a tree for 1 hour versus some other types of plants for only a few minutes. Planning drip irrigation is simple. Every major manufacturer of the drip systems have the filters and pressure regulators on drippers so you don’t have to worry about overpressuring, etc. Check out this guide for more information on planning your drip irrigation system. However, its always a good decision to include a pressure regulator in your design to extend the life of the drippers. Planning how many sprinkler heads you need for your lawn area is more complicated. When planning lawn irrigation for installing your own sprinkler system, the first thing you need to do is a get a healthy understanding of pipe diameters, flow rate and the amount of pressure your main water supply has. Check out the chart on page 7 of this irrigation manual from RainBird. Also, this manual does a fabulous job of giving you very detailed information and education on the whole sprinkler installation process. A. Determine your water pressure (PSI). You can do this by using a pressure gauge in your hose bib. The pressure gauge will tell you what your water pressure PSI is (pounds per square inch). According to RainBird (in video below), the ideal window is between 40 – 60 PSI. This video does a great job of explaining the PSI and how to find your water pressure. B. Figure out your home’s flow capacity (GPM). Next you need to figure how how much flow capacity you have, also known as GPM, or gallons per minute. To do this, you can time how long it takes to fill up a 5 gallon bucket. The equation you use to determine the GPM is Gallons (size of your bucket) divided by time (seconds) X 60 = GPM. This video shows you how it all breaks down. I know it sounds complicated, but it’s really pretty simple. Promise. Once you figure out the numbers you’re working with at your house, it’s time to make an irrigation map. This step is crucial when you are installing your own sprinkler system. Rain Bird has a very handy planning tool for designing your sprinkler system. You can order a detailed irrigation design plan by entering all of your information here and providing them with a map. They will return an irrigation plan to you via email within 10 days for FREE! Home Depot also provides an online planning tool for designing your sprinklers. Alternatively, you can draw your lawn to scale using graph paper to make your plan to figure out how many sprinkler heads you need. Consider the shape of your lawn to determine the type of sprinkler head you need. Here’s a guide for you to learn more about all of the different types of sprinkler heads and what they are used for. Our back lawn is a large rectangle and the front lawn is a large funky shape. For the back lawn, we used pop-ups. For the front lawn, rotors make more sense. Note: rotors typically need to run longer than pop-ups because of how they water (in a rotating fashion, rather than everything all at once like a pop-up). We ended up having 3 zones on our lawns (1 for our front lawn and 2 for our back lawn) and 5 zones of drip irrigation for planters, trees and raised bed gardens. Consider any sloped areas. If the slope is more than 10%, it will require it’s own zone and planning. Here’s a great tutorial on how to measure a slope. P.S. If you’re dealing with any rainwater drainage issues, here are some great DIY backyard drainage solutions. Sun vs. shade. Shaded areas will need to be watered differently than ones that get full sun. Consider each sprinkler’s GPM when planning zones. Each sprinkler head has a specific gallons per minute indicated on the package. Once you know what kind of sprinklers you will be using, you will be able to plan the specific zones. For example, if you home has a capacity of 20 GPM and the heads you are installing on your lawn take 2 GPM, you can use up to 10 heads per zone. However, it’s never a good idea to max out each zone. When watering your lawn, overlapping sprinkler coverage is best to maximum coverage. My husband and I have been wanting to install our own irrigation system for our lawn. That is a great idea to make a map of exactly where we need everything to go! A map would be the perfect thing to have if we also need to hire some help to help us finish the project. Thank you for all these amazing tips!